See in Glossary Window (menu: Window > General > Console) shows errors, warnings and other messages generated by Unity. To aid with debugging, you can also show your own messages in the Console using the Debug.Log, Debug.LogWarning and Debug.LogError functions. See in Glossary of the console window has a number of options that affect how messages are displayed. The Clear button removes any messages generated from your code but retains compiler errors. You can arrange for the console to be cleared automatically whenever you run the game by enabling the Clear On Play option. Finally, there are two options for viewing additional information about errors. The Open Player Log and Open Editor Log items on the console tab menu access Unity’s log files which record details that may not be shown in the console. See the page about Log Files for further information. When obsolete API calls are detected, Unity will show a warning message about them. When you double-click this message, Unity will attempt to upgrade the deprecated usage to the recommended equivalent automatically. To adjust the number of lines that a log entry displays in the list, click the exclamation button, go to Log Entry, and choose the number of lines. This allows you to set the granularity you want for the window in terms of the amount of context versus how many entries fit in the window. 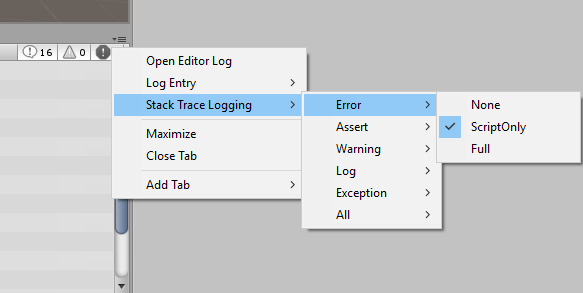 You can specify how accurate stack trace should be captured when log message is printed to the console or log file. You can also control stack trace logging via scripting API. See API reference documentation on Application.stackTraceLogType for more details.